Symposium covering the topic of the Serbian military medical service in the First World War, organized by Military Healthcare Department and Academy of Medical Sciences of the Serbian Medical Society took place at the Military Medical Academy. The meeting was opened by Brigadier General Prof. Dr. Marijan Novaković, the MMA Head, who was succeeded by Prof. Dr. Pavle Milenković, the Head of the SMS Academy of Medical Sciences. General Novaković said that in this year when entire world celebrates one hundred years from the beginning of World War I, Serbian medical service is marking two important jubilees, i.e. 175 years of existence and 170 years since the first military hospital, the MMA forerunner, has been established. The MMA Head highlighted the fact that Serbian military medical service members in First World War, "with their extreme effort and sacrifice, even in the most difficult conditions and lacking in human resources, medications and medical materiel, were a reliable support to the Army, providing it with the assistance in many victories with the minor number of human victims". According to his words, the key of this important support relays in service modern organization, war surgery and wartime surgical doctrine, as well as in high ethics demonstrated among the medical staff who has never abandoned its wounded and sick patients and in the same way treated both Serbian soldiers and enemies prisoners. Introductory lecture also had Prim. 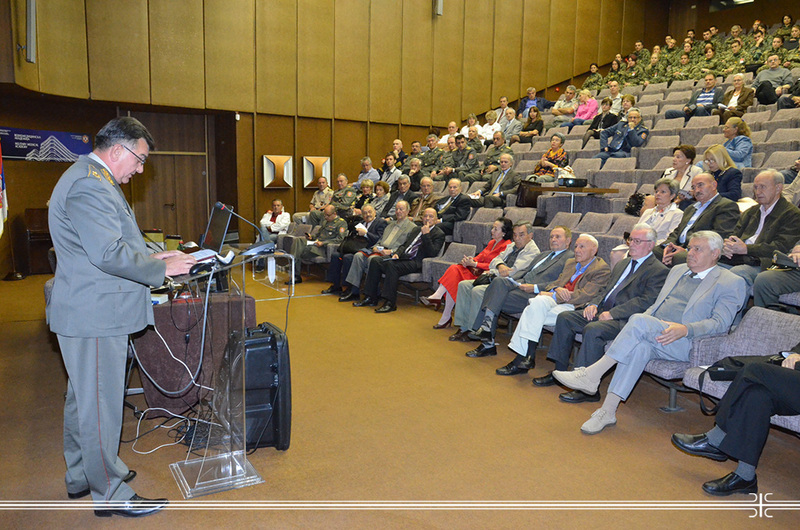 Scientific Advisor Dr. Aleksandar Nedok, while the other speakers were retired Generals Milisav Sekulić, Asst. Prof. Dr. Veljko Todorović and Prim. Dr. Branislav Popović, then Colonels Prof. Dr. Dragan Mikić and Asst. Prof. Dr. Mile Ignjatović, accompanied by Lt. Col. Asst. Prof. Dr. Radivoje Anđelković, Prof. Dr. Dragan Stupar and retired Colonel Luka Nikolić. Dr. Nedok reminded all present that Serbian army mobilized 409 doctors, including 25 surgeons, 203 medicals, 190 pharmacists and 60 veterinarians. Only one doctor was responsible for 1.200 soldiers, as something unbelievably, whilst one surgeon treated between 300 and 800 wounded, depending from military operations. According to the collected data, Serbia lost in the World War I 1.247.435 people or 28% of total population. In the action of helping people and army, 128 physicians, veterinarians and pharmacists died, although the largest percent were typhus victims. -From all medical officers none of them survived the war, while among the second class captains almost all have died. In the other words, the hope of military medical service has died, Dr. Nedok pointed out. That immeasurable number of victims along with the humanity demonstrated by doctors and entire medical staff cannot be forgotten, because the oblivion represents the most severe word in each national history, thus, nation without pass is in fact nation without the future, added Dr. Nedok. Symposium presented the work of military medical service during the First World War, i.e. military medical and veterinarian service organization and functioning, medical supply and role of pharmacist, as well as surgical treatment and epidemics of diverse diseases. It also covered the topic about the medical casualties in World War I, Bizerte and its role in treatment, renewing and Serbian army units’ completion, then about the heroism of medical foreign missions’ representatives in Serbian armed forces and role of Red Cross in World War I.